Below is a look at the 2018 YTD performance of major commodities. As shown, natural gas is up 47.2%, which is by far the biggest gainer of the bunch. 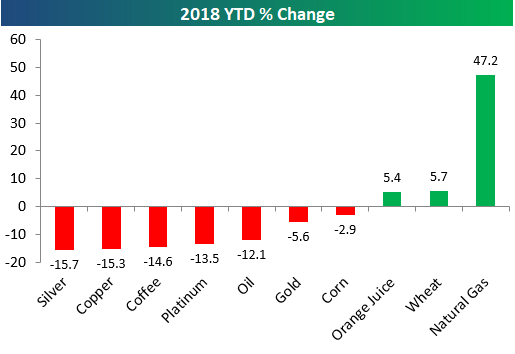 Wheat and orange juice are the only other two commodities in the green on the year with gains of 5%+. While corn and gold are down single-digit percentage points, the remaining five commodities in the chart are down more than 10%. Silver and copper lead the way lower with declines of 15%+, while coffee is down 14.6%, platinum is down 13.5%, and oil is down 12.1%. Below are trading range charts for four of key commodities in the chart above — oil, gold, natural gas, and silver. The green shading in the chart represents between two standard deviations above and below the 50-day moving average. Moves to the top of this range are considered overbought, while moves to the bottom of the range are considered oversold. Oil’s sharp decline from its highs a couple months ago has widened out its trading range dramatically, and it’s still trading right near the bottom of its range after a bounce over the last couple of days. To get back to overbought levels from here, oil needs to rally 50%! Natural gas, on the other hand, is trading at the top of its trading range after experiencing a dramatic spike higher in November. For the two precious metals, gold has started to trade positively lately after breaking out of its long-term downtrend with a series of higher lows over the last few months. The same can’t be said for silver, though, which hasn’t made as positive of a move as gold.